The alkaline earth metals are six chemical elements in column (group) 2 of the Periodic table. They are beryllium (Be), magnesium (Mg), calcium (Ca), strontium (Sr), barium (Ba), and radium (Ra). They have very similar properties: they are all shiny, silvery-white, somewhat reactive metals at standard temperature and pressure. Structurally, they have in common an outer s- electron shell which is full; that is, this orbital contains its full complement of two electrons, which these elements readily lose to form cations with charge +2, and an oxidation state (oxidation number) of +2. All the discovered alkaline earth metals occur in nature. Experiments have been conducted to attempt the synthesis of element 120, the next potential member of the group, but they have all met with failure. The alkaline earth metals are all silver-colored and soft, and have relatively low densities, melting points, and boiling points. In chemical terms, all of the alkaline metals react with the halogens to form the alkaline earth metal halides, all of which are ionic crystalline compounds (except for beryllium chloride, which is covalent). All the alkaline earth metals except beryllium also react with water to form strongly alkaline hydroxides and, thus, should be handled with great care. The heavier alkaline earth metals react more vigorously than the lighter ones. The alkaline metals have the second-lowest first ionization energies in their respective periods of the periodic table because of their somewhat low effective nuclear charges and the ability to attain a full outer shell configuration by losing just two electrons. The second ionization energy of all of the alkaline metals is also somewhat low. All of the alkaline earth metals except magnesium and strontium have at least one naturally occurring radioisotope: beryllium-7, beryllium-10, and calcium-41 are trace radioisotopes, calcium-48 and barium-130 have very long half-lives and, thus, occur naturally, and all isotopes of radium are radioactive. Calcium-48 is the lightest nuclide to undergo double beta decay. The natural radioisotope of calcium, calcium-48, makes up about 0.1874% of natural calcium, and, thus, natural calcium is weakly radioactive. Barium-130 makes up approximately 0.1062% of natural barium, and, thus, barium is weakly radioactive, as well. Emerald, a variety of beryl, the mineral that beryllium was first known to be in. 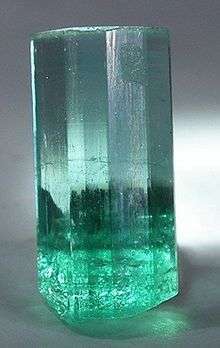 Beryl, a mineral that contains beryllium, has been known since the time of the Ptolemaic dynasty in Egypt. 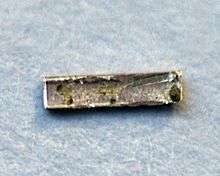 Although it was originally thought that beryl was an aluminium silicate, beryl was later found to contain a then-unknown element when, in 1797, Louis-Nicolas Vauquelin dissolved aluminium hydroxide from beryl in an alkali. In 1828, Friedrich Wöhler and Antoine Bussy independently isolated this new element, beryllium, by the same method, which involved a reaction of beryllium chloride with metallic potassium; this reaction was not able to produce large ingots of beryllium. It was not until 1898, when Paul Lebeau performed an electrolysis of a mixture of beryllium fluoride and sodium fluoride, that large pure samples of beryllium were produced. Magnesium was first produced by Sir Humphry Davy in England in 1808 using electrolysis of a mixture of magnesia and mercuric oxide. Antoine Bussy prepared it in coherent form in 1831. Davy’s first suggestion for a name was magnium, but the name magnesium is now used. In 1790, physician Adair Crawford, who had been working with barium, realized that Strontian ores showed different properties than other supposed ores of barium. Therefore, he concluded that these ores contained new minerals, which were named strontites in 1793 by Thomas Charles Hope, a chemistry professor at the University of Glasgow, who confirmed Crawford's discovery. Strontium was eventually isolated in 1808 by Sir Humphry Davy by electrolysis of a mixture of strontium chloride and mercuric oxide. The discovery was announced by Davy on 30 June 1808 at a lecture to the Royal Society. Magnesium and calcium are very common in the earth's crust, with calcium the fifth-most-abundant element, and magnesium the eighth. None of the alkaline earth metals are found in their elemental state, but magnesium and calcium are found in many rocks and minerals: magnesium in carnallite, magnesite, and dolomite; and calcium in chalk, limestone, gypsum, and anhydrite. Strontium is the fifteenth-most-abundant element in the Earth's crust. Most strontium is found in the minerals celestite and strontianite. Barium is slightly less common, much of it in the mineral barite. To produce barium, barite ore is separated from quartz, sometimes by froth flotation methods, resulting in relatively pure barite. Carbon is then used to reduce the baryte into barium sulfide, which is dissolved with other elements to form other compounds, such as barium nitrate. These in turn are thermally decompressed into barium oxide, which eventually yields pure barium after a reaction with aluminium. The most important supplier of barium is China, which produces more than 50% of world supply. Magnesium has many different uses. One of its most common uses was in industry, where it has many structural advantages over other materials such as aluminium, although this usage has fallen out of favor recently due to magnesium's flammability. Magnesium is also often alloyed with aluminium or zinc to form materials with more desirable properties than any pure metal. 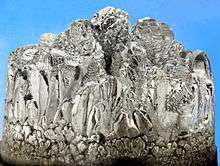 Magnesium has many other uses in industrial applications, such as having a role in the production of iron and steel, and the production of titanium. Strontium and barium do not have as many applications as the lighter alkaline earth metals, but still have uses. Strontium carbonate is often used in the manufacturing of red fireworks, and pure strontium is used in the study of neurotransmitter release in neurons. Barium has some use in vacuum tubes to remove gases, and barium sulfate has many uses in the petroleum industry, as well as other industries. Although simple extrapolation would put element 170 as the next member of this series, calculations suggest that the next element of this series might actually be element 166. ↑ Noble gas notation is used for conciseness; the nearest noble gas that precedes the element in question is written first, and then the electron configuration is continued from that point forward. ↑ Energies are given in −kJ/mol, solubilities in mol/L; HE means "hydration energy". ↑ The number given in parentheses refers to the measurement uncertainty. This uncertainty applies to the least significant figure(s) of the number prior to the parenthesized value (i.e., counting from rightmost digit to left). For instance, 7000100794000000000♠1.00794(7) stands for 7000100794000000000♠1.00794±0.00007, whereas 7000100794000000000♠1.00794(72) stands for 7000100794000000000♠1.00794±0.00072. ↑ The element does not have any stable nuclides, and a value in brackets indicates the mass number of the longest-lived isotope of the element. ↑ The color of the flame test of pure radium has never been observed; the crimson-red color is an extrapolation from the flame test color of its compounds. ↑ International Union of Pure and Applied Chemistry (2005). Nomenclature of Inorganic Chemistry (IUPAC Recommendations 2005). Cambridge (UK): RSC–IUPAC. ISBN 0-85404-438-8. pp. 51. Electronic version..
1 2 3 4 5 6 7 8 9 10 Royal Society of Chemistry. "Visual Elements: Group 2–The Alkaline Earth Metals". Visual Elements. Royal Society of Chemistry. Retrieved 13 January 2012. ↑ "Periodic Table: Atomic Properties of the Elements" (PDF). nist.gov. National Institute of Standards and Technology. September 2010. Retrieved 17 February 2012. 1 2 3 4 5 6 7 Lide, D. R., ed. (2003). CRC Handbook of Chemistry and Physics (84th ed.). Boca Raton, FL: CRC Press. ↑ "Abundance in Earth's Crust". WebElements.com. Retrieved 14 April 2007. 1 2 3 Jakubke, Hans-Dieter; Jeschkeit, Hans, eds. (1994). Concise Encyclopedia Chemistry. trans. rev. Eagleson, Mary. Berlin: Walter de Gruyter. ↑ Bell, N. A. (1972). "Beryllium halide and pseudohalides". In Emeléus, Harry Julius; Sharpe, A. G. Advances in inorganic chemistry and radiochemistry, Volume 14. New York: Academic Press. pp. 256–277. ISBN 978-0-12-023614-5. ↑ Walsh, Kenneth A. (2009-08-01). Beryllium chemistry and processing. ASM International. pp. 99–102, 118–119. ISBN 978-0-87170-721-5. ↑ Hertz, Raymond K. (1987). "General analytical chemistry of beryllium". In Coyle, Francis T. Chemical analysis of metals: a symposium. ASTM. pp. 74–75. ISBN 978-0-8031-0942-1. ↑ Wiberg, Wiberg & Holleman 2001, pp. XXXVI–XXXVII. ↑ Wiberg, Wiberg & Holleman 2001, p. XXXVI. ↑ Lide 2004, p. 12-23. ↑ Wiberg, Wiberg & Holleman 2001, p. 1073. ↑ "Standard Uncertainty and Relative Standard Uncertainty". CODATA reference. National Institute of Standards and Technology. Retrieved 26 September 2011. 1 2 Wieser, Michael E.; Berglund, Michael (2009). "Atomic weights of the elements 2007 (IUPAC Technical Report)" (PDF). Pure Appl. Chem. IUPAC. 81 (11): 2131–2156. doi:10.1351/PAC-REP-09-08-03. Retrieved 7 February 2012. 1 2 Wieser, Michael E.; Coplen, Tyler B. (2011). "Atomic weights of the elements 2009 (IUPAC Technical Report)" (PDF). Pure Appl. Chem. IUPAC. 83 (2): 359–396. doi:10.1351/PAC-REP-10-09-14. Retrieved 11 February 2012. ↑ Slater, J. C. (1964). "Atomic Radii in Crystals". Journal of Chemical Physics. 41 (10): 3199–3205. Bibcode:1964JChPh..41.3199S. doi:10.1063/1.1725697. ↑ Jensen, William B. (2003). "The Place of Zinc, Cadmium, and Mercury in the Periodic Table" (PDF). Journal of Chemical Education. American Chemical Society. 80 (8): 952–961. Bibcode:2003JChEd..80..952J. doi:10.1021/ed080p952. Archived from the original (PDF) on 2010-06-11. Retrieved 2012-05-06. ↑ G. Audi; A. H. Wapstra; C. Thibault; J. Blachot; O. Bersillon (2003). "The NUBASE evaluation of nuclear and decay properties" (PDF). Nuclear Physics A. 729: 3–128. Bibcode:2003NuPhA.729....3A. doi:10.1016/j.nuclphysa.2003.11.001. ↑ Richard B. Firestone (15 March 2010). "Isotopes of Calcium (Z=20)". Lawrence Berkeley National Laboratory. Retrieved 12 June 2012. ↑ Richard B. Firestone (15 March 2010). "Isotopes of Barium (Z=56)". Lawrence Berkeley National Laboratory. Retrieved 12 June 2012. ↑ Robert E. Krebs (2006). The history and use of our earth's chemical elements: a reference guide. Greenwood Publishing Group. pp. 65–81. ISBN 0-313-33438-2. 1 2 Miller, M. Michael. "Commodity report:Lime" (PDF). United States Geological Survey. Retrieved 2012-03-06. 1 2 Weeks 1968, p. 535. 1 2 Weeks, Mary Elvira (1932). "The discovery of the elements. X. The alkaline earth metals and magnesium and cadmium". Journal of Chemical Education. 9 (6): 1046. Bibcode:1932JChEd...9.1046W. doi:10.1021/ed009p1046. 1 2 Weeks, Mary Elvira (1932). "The discovery of the elements. XII. Other elements isolated with the aid of potassium and sodium: Beryllium, boron, silicon, and aluminum". Journal of Chemical Education. 9 (8): 1386. Bibcode:1932JChEd...9.1386W. doi:10.1021/ed009p1386. 1 2 Weeks, Mary Elvira (1933). "The discovery of the elements. XIX. The radioactive elements". Journal of Chemical Education. 10 (2): 79. Bibcode:1933JChEd..10...79W. doi:10.1021/ed010p79. ↑ Vauquelin, Louis-Nicolas (1798). "De l'Aiguemarine, ou Béril; et découverie d'une terre nouvelle dans cette pierre". Annales de Chimie (26): 155–169. ↑ Wöhler, Friedrich (1828). "Ueber das Beryllium und Yttrium". Annalen der Physik. 89 (8): 577–582. Bibcode:1828AnP....89..577W. doi:10.1002/andp.18280890805. ↑ Bussy, Antoine (1828). "D'une travail qu'il a entrepris sur le glucinium". Journal de Chimie Medicale (4): 456–457. 1 2 Weeks 1968, p. 539. 1 2 Davy, H. (1808). "Electro-chemical researches on the decomposition of the earths; with observations on the metals obtained from the alkaline earths, and on the amalgam procured from ammonia". Philosophical Transactions of the Royal Society of London. 98: 333–370. Bibcode:1808RSPT...98..333D. doi:10.1098/rstl.1808.0023. JSTOR 107302. ↑ Williams, Richard (2004). Lime Kilns and Lime Burning. p. 4. ISBN 978-0-7478-0596-0. ↑ Oates, J. A. H (2008-07-01). Lime and Limestone: Chemistry and Technology, Production and Uses. ISBN 978-3-527-61201-7. ↑ Davy H (1808). "Electro-chemical researches on the decomposition of the earths; with observations on the metals obtained from the alkaline earths, and on the amalgam procured from ammonia". Philosophical Transactions of the Royal Society of London. 98: 333–370. Bibcode:1808RSPT...98..333D. doi:10.1098/rstl.1808.0023. ↑ Crawford, Adair (1790). "On the medicinal properties of the muriated barytes". Medical Communications. London. 2: 301–359. ↑ Murray, T. (1993). "Elemementary Scots: The Discovery of Strontium". Scottish Medical Journal. 38 (6): 188–189. PMID 8146640. ↑ Davy, Humphry (1808). researches on the decomposition of the earths; with observations on the metals obtained from the alkaline earths, and on the amalgam procured from ammonia. 98. Philosophical Transactions of the Royal Society of London. pp. 333–370. ↑ "Masthead". Annalen der Chemie und Pharmacie. 93 (3): fmi–fmi. 1855. doi:10.1002/jlac.18550930301. ↑ Wagner, Rud. ; Neubauer, C.; Deville, H. Sainte-Claire; Sorel; Wagenmann, L.; Techniker; Girard, Aimé (1856). "Notizen". Journal für Praktische Chemie. 67: 490–508. doi:10.1002/prac.18560670194. ↑ Curie, Pierre; Curie, Marie; Bémont, Gustave (1898). "Sur une nouvelle substance fortement radio-active, contenue dans la pechblende (On a new, strongly radioactive substance contained in pitchblende)". Comptes Rendus. 127: 1215–1217. Retrieved 2009-08-01. ↑ "radium". Online Etymology Dictionary. Retrieved 20 August 2011. ↑ Merck contributors (2006). O'Neil, Marydale J.; Heckelman, Patricia E.; Roman, Cherie B., eds. The Merck Index: An Encyclopedia of Chemicals, Drugs, and Biologicals (14th ed.). Whitehouse Station, NJ, USA: Merck Research Laboratories, Merck & Co., Inc. ISBN 0-911910-00-X. ↑ Emsley, John (2001). Nature's Building Blocks: An A–Z Guide to the Elements. Oxford, England, UK: Oxford University Press. ISBN 0-19-850340-7. ↑ "Abundance in oceans". Mark Winter, The University of Sheffield and WebElements Ltd, UK. WebElements. Retrieved 6 August 2011. ↑ "Abundance in stream water". Mark Winter, The University of Sheffield and WebElements Ltd, UK. WebElements. Retrieved 6 August 2011. ↑ Ober, Joyce A. "Mineral Commodity Summaries 2010: Strontium" (PDF). United States Geological Survey. Retrieved 2010-05-14. 1 2 3 4 Kresse, Robert; Baudis, Ulrich; Jäger, Paul; Riechers, H. Hermann; Wagner, Heinz; Winkler, Jocher; Wolf, Hans Uwe (2007). "Barium and Barium Compounds". In Ullman, Franz. Ullmann's Encyclopedia of Industrial Chemistry. Wiley-VCH. doi:10.1002/14356007.a03_325.pub2. 1 2 "Radium", Los Alamos National Laboratory. Retrieved on 2009-08-05. ↑ Malley, Marjorie C (2011-08-25). Radioactivity. pp. 115–. ISBN 978-0-19-983178-4. ↑ Kemal, Mevlüt; Arslan, V; Akar, A; Canbazoglu, M (1996). Production of SrCO, by black ash process: Determination of reductive roasting parameters. p. 401. ISBN 9789054108290. ↑ Miller, M. M. "Barite" (PDF). USGS.gov. ↑ Petzow, G. N.; Aldinger, F.; Jönsson, S.; Welge, P.; Van Kampen, V.; Mensing, T.; Brüning, T. (2005). "Beryllium and Beryllium Compounds". Ullmann's Encyclopedia of Industrial Chemistry. doi:10.1002/14356007.a04_011.pub2. ISBN 3527306730. ↑ Diehl, Roland (2000). High-power diode lasers. Springer. p. 104. ISBN 3-540-66693-1. ↑ "Purdue engineers create safer, more efficient nuclear fuel, model its performance". Purdue University. 27 September 2005. Retrieved 18 September 2008. ↑ Davis, Joseph R. (1998). "Beryllium". Metals handbook. ASM International. pp. 690–691. ISBN 978-0-87170-654-6. ↑ Schwartz, Mel M. (2002). Encyclopedia of materials, parts, and finishes. CRC Press. p. 62. ISBN 1-56676-661-3. 1 2 Gray, Theodore (2009). The Elements: A Visual Exploration of Every Known Atom in the Universe. New York: Black Dog & Leventhal Publishers. ISBN 978-1-57912-814-2. ↑ Baker, Hugh D. R.; Avedesian, Michael (1999). Magnesium and magnesium alloys. Materials Park, OH: Materials Information Society. p. 4. ISBN 0-87170-657-1. ↑ Amundsen, K.; Aune, T. K.; Bakke, P.; Eklund, H. R.; Haagensen, J. Ö.; Nicolas, C.; Rosenkilde, C.; Van Den Bremt, S.; Wallevik, O. (2003). "Magnesium". Ullmann's Encyclopedia of Industrial Chemistry. doi:10.1002/14356007.a15_559. ISBN 3527306730. ↑ Moreno, Teresa; Querol, Xavier; Alastuey, Andrés; Cruz Minguillón, Mari; Pey, Jorge; Rodriguez, Sergio; Vicente Miró, José; Felis, Carles; Gibbons, Wes (2007). "Recreational atmospheric pollution episodes: Inhalable metalliferous particles from firework displays". Atmospheric Environment. 41 (5): 913. Bibcode:2007AtmEn..41..913M. doi:10.1016/j.atmosenv.2006.09.019. ↑ Miledi, R. (1966). "Strontium as a Substitute for Calcium in the Process of Transmitter Release at the Neuromuscular Junction". Nature. 212 (5067): 1233–4. Bibcode:1966Natur.212.1233M. doi:10.1038/2121233a0. PMID 21090447. ↑ Hagler D.J., Jr; Goda Y. (2001). "Properties of synchronous and asynchronous release during pulse train depression in cultured hippocampal neurons". J. Neurophysiol. 85 (6): 2324–34. PMID 11387379. ↑ Jones, Chris J.; Thornback, John (2007). Medicinal applications of coordination chemistry. Royal Society of Chemistry. p. 102. ISBN 0-85404-596-1. ↑ Terrill Jr, JG; Ingraham Sc, 2nd; Moeller, DW (1954). "Radium in the healing arts and in industry: Radiation exposure in the United States". Public Health Reports. 69 (3): 255–62. doi:10.2307/4588736. PMC 2024184 . PMID 13134440. ↑ "Mass Media & Environmental Conflict – Radium Girls". Retrieved 2009-08-01. ↑ Committee On Radiation Source Use And Replacement, National Research Council (U.S.); Nuclear And Radiation Studies Board, National Research Council (U.S.) (January 2008). Radiation source use and replacement: Abbreviated version. p. 24. ISBN 978-0-309-11014-3. ↑ Bentel, Gunilla Carleson (1996). Radiation therapy planning. p. 8. ISBN 978-0-07-005115-7. ↑ Gäggeler, Heinz W. (5–7 November 2007). "Gas Phase Chemistry of Superheavy Elements" (PDF). Lecture Course Texas A&M. Retrieved 26 February 2012. ↑ Oganessian, Yu. Ts. ; Utyonkov, V.; Lobanov, Yu. ; Abdullin, F.; Polyakov, A.; Sagaidak, R.; Shirokovsky, I.; Tsyganov, Yu. ; Voinov, A. (2009). "Attempt to produce element 120 in the 244Pu+58Fe reaction". Phys. Rev. C. 79 (2): 024603. Bibcode:2009PhRvC..79b4603O. doi:10.1103/PhysRevC.79.024603. 1 2 Seaborg, G. T. (c. 2006). "transuranium element (chemical element)". Encyclopædia Britannica. Retrieved 16 March 2010.